Bali, Indonesia is known for its rich culture and tradition. There are many places in Bali which are not commercialized and they are a perfect holiday destination. 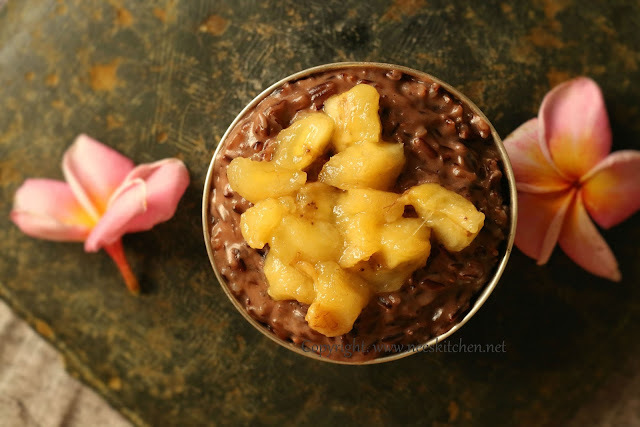 During our visit to Bali I tasted this Black rice pudding and all of us liked it. Black glutinous rice cooked with cocunut milk, pandan leaves(optional), gula melaka and served with banana's gives this drool worthy pudding. It is a must to soak the black rice for a minimum of 6 hours or over night else they will never get cooked so easily. I soak them in hot water to make it more easier. Pandan leaves are optional and they give a nice flavor to the dish. The banana’s must be ripened to get a good taste. 1. Wash and Soak in hot water the black rice for 6 hours. 2. Cook rice with coconut milk, water and a pinch of salt in high flame and once it starts to boil bring it to low flame. 3. Keep cooking until the entire liquid is almost absorbed in the rice and the rice gets cooked. Its fine to leave a little bit of liquid as the pudding will continue to thicken once it starts to cool. 4. Slice the banana’s and keep ready before serving. 5. Just before serving drizzle with coconut milk and add the sliced banana’s. 6. You may serve this hot or cold. 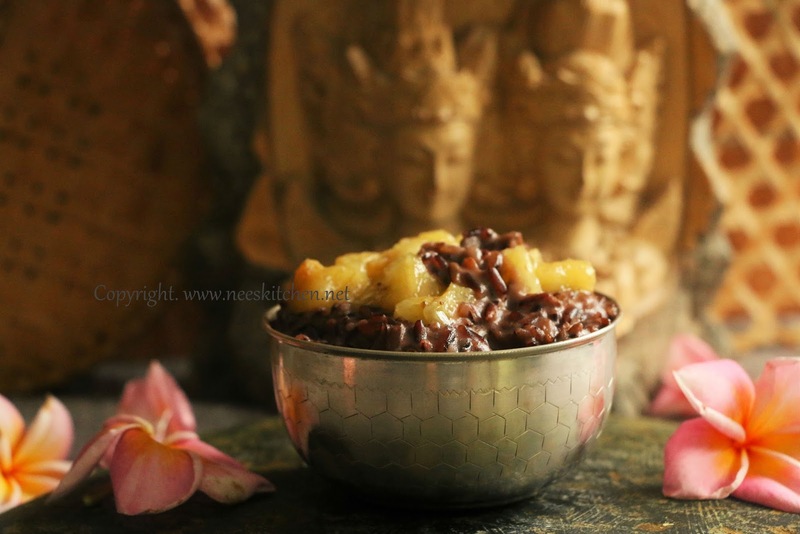 Balinese style black rice pudding is ready. It is a must for the rice to be soaked for a minimum of 6 hours or overnight. I have omitted pandan leaves for this post.